Aharmonic filteris used to eliminate theharmonicdistortion caused by appliances. Harmonic Filter Reactors are made out of highest quality material and very stringent quality control. We are affianced in providing a wide assortment of Harmonic Filter that is designed using high grade material and modern machinery in tune with the set global standards. Our Active Filter is massively applauded for its premium standards, reliability, timely execution, and most affordable prices. An Active Harmonic Filter is a piece of equipment that reads the incoming voltage and current and injects current waveforms that that cancel distortion. Active filters are capable of dealing with very low frequencies. A passive ¿¿¿lter component is a combination of capacitors and inductors that are tuned to resonate at a single frequency, or through a band of frequencies. 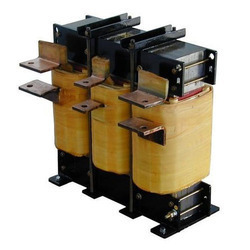 In power systems, passive ¿¿¿lters are used to suppress harmonic currents and decrease voltage distortion appearing in sensitive parts of the system. Passive ¿¿¿lters work by exhibiting di¿¿¿erent impedance values at the resonant frequency. With the team of diligent professionals, we are deeply involved in offering best Harmonic Filters. Highly efficient in working, these filters are reliable and remain sustained for longer years. A harmonic filter is used to eliminate the harmonic distortion caused by appliances.